First Time Mama - First Time Blogger: When a cough is not a cold ... ...Or anything else! So I reported a few days ago that Julianna had a cough that was getting worse. She has not been sick yet and I knew I would dread when the day finally came when did get a cold. Well... turns out she is OK...kind of. She seemed to be getting worse on Tuesday night, so I took her to the pediatrician as a precaution on Wednesday. She was not stuffed up and did not have a fever... but I took her anyway... just in case! The pediatrician said Julianna's nose, ears, and chest were crystal clear - and since there was no fever, she was not concerned at all. She said it might even be spring allergies (I have allergies & just getting over a sinus infection myself). But obviously she said to keep an eye on things and if she gets worse, let her know. I have had the humidifier cranked up in Jule's room every night and put Vick's baby rub (non-medicated) on her chest and back before bed - and she seems to be better. She barely coughed at all last night and this morning. So whatever it was seems to be dissipating. Knock on wood. I think we dodged the bullet here. No cold. No flu. Nothing worse. So do I count this as her first time being sick? Or do I wait for her first cold to hit - and count that as her first? Have a very nice weekend everyone! Thank goodness it's Friday! 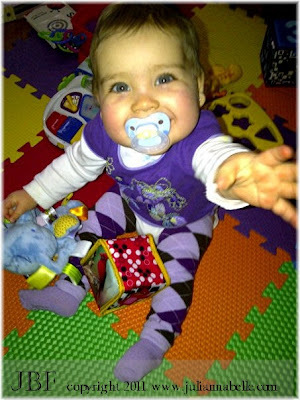 I had to post this cute picture below - It was taken with my blackberry (hence the graininess) - and I just love those purple argyle baby legs! Bless her little heart. I hope that she gets better and that the cough does not occur again. I along with other moms have encountered these coughing episodes. It is so frustrating when doctors can't tell you what's wrong. Do your own research on coughs on babies/toddlers so that you have an idea what may be going on. For us, it turned out my babe has asthma and many other children, but not your typical asthma, just the cough kind. I love reading your blog. Your daughter is gorgeous. I hope her nose gets better! Good news, the cough went away as soon as it started. Turns out it was nothing ... going to keep the asthma thing in mind Simplegirl - thanks for the advice!